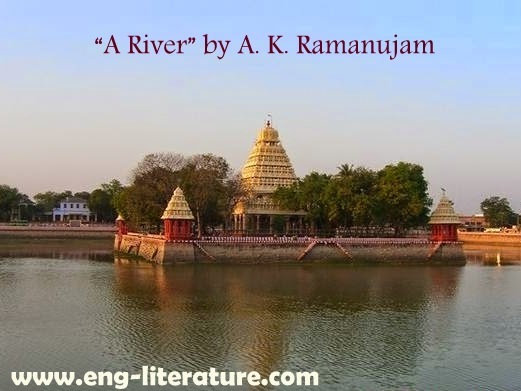 Indian Writing in English Indo-Anglican Literature Poetry Critical Appreciation of Ramanujan's poem "A River" or What light does a river throw on the poetical characteristics of Ramanujan? or Comment on Ramanujan's use of Irony in the poem "A River"
Critical Appreciation of Ramanujan's poem "A River" or What light does a river throw on the poetical characteristics of Ramanujan? or Comment on Ramanujan's use of Irony in the poem "A River"
A.K. Ramanujan’s ‘A River’ is of his finest poem taken from his magnum opus, The Striders (1965). Here the poet has compared and contrasted the attitudes of the old poets and those of the new poets to human suffering. He has come to the conclusion that both the groups of the poets are indifferent to human sorrow and suffering. Their poetry does not reflect the miseries of the human beings. He has proved this point in the present poem. The poem is all about a river, Vaigai which flows through the heart of Madurai city, the centre of Tamil culture. The word Madurai means a “sweet city”. It is a Tamil word. As a matter of fact, this city is the seat of Tamil culture and learning. It is also a holy city full of temples including the famous Meenakshi Temple. The poets have written many poems on the temples and the river. In the poem A River the poet presents two strikingly contrasting pictures of the river: a vivid picture of the river in the summer season and the river in its full flow when the floods arrive with devastating fury. The above lines satirize and debunk the traditional romantic view of the river Vaigai in Madurai, by the ancient poets. The image of “pregnant woman” implies a fine example of two generations, the present and the future. This is a poignant imagery full of pathos. R. Parthasarathy verily remarks “The relative attitudes of the old and new Tamil poets, both of whom are exposed for their callousness to suffering, when it is so obvious as a result of the flood.” The coloured diapers of the twins symbolize the black people and the white people. The use of wit, irony and humour, and dramatic imagery is distinctive of his style. Also we may label “A River” as a tragic-comic poem.